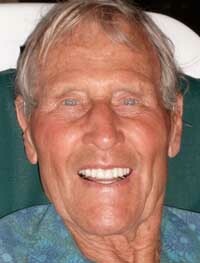 Doug Christensen, 87, died peacefully in his sleep at home in Ketchum, Idaho, early Wednesday morning, Jan. 25, 2012, of congestive heart failure. Born Nov. 4, 1924, in San Francisco, Doug was the son of Raymond and Louise Christensen. He loved his birth city and attended Aptos Junior High and Lowell High School until his parents moved the family south to Redwood City to provide his younger brother, Ray, with a sunnier environment. Doug graduated from Sequoia Union High School in 1942 and attended San Jose State until he enlisted in the Army Air Corps in 1943. After his honorable discharge in 1946, he helped his parents build their dream house and loved the creativity of building, which became his lifelong career. He moved to Marin County, Calif., in 1949, where he learned the construction business on the job as a journeyman carpenter and foreman. Doug established D. M. Christensen Construction Co. in 1955 and was known for his well-built single-family homes and later condominiums and commercial buildings. He retired from construction in 1981, but remained active as a builder on family projects and as a commercial real estate investor until his death. On June 11, 1960, Doug and Ann Churchill Lindenberger of Louisville, Ken., were married. They made their home in Kentfield, Calif., with their daughters, Eloise McLean Christensen and Aimée Russell Christensen. Doug's children from his first marriage, Shelley Anne Christensen, Robin Louise Christensen and Colin Lea Christensen, were always an important part of his life and gave him five grandchildren and six great-grandchildren. In Marin, Doug was a member of the executive committee of the Marin County Development Foundation and served on the Marin County Airport Commission. Doug first became involved with the environmental movement in the late 1960s as a member of the Conservation Committee of the Bay Chapter of the Sierra Club. The organization successfully limited the size of a shopping center that would have destroyed valuable wetlands along the shore of San Francisco Bay. He served on the executive committee of the Marin Conservation League and the Conservation Committee of the Marin Chapter of the National Audubon Society, and was the first male member of the Marin Environmental Forum. In 1983 the family moved to Sun Valley in central Idaho which had captured their hearts while leading a Sierra Club trip into the White Cloud mountains in 1977. Doug immediately became active in the Idaho Conservation League, serving as board secretary. He was a founding member of Idaho Rivers United and served as board president of the Wolf Education and Research Center for many years. He worked tirelessly for Idaho's salmon, wolves and wildlands. In addition to Idaho, Doug also fell in love with Mexico, first diving in the Mexican Caribbean in the 1960s with Ann, and eventually building Casa Christensen on his beloved Yalku Lagoon in Akumal. He spent as much time as possible swimming and sunning there and fighting to protect this incredibly special place and the turtles and sea life from overdevelopment, pollution and illegal fishing. Doug's dedication was recognized in the form of a number of awards to him and Ann, including the Light on the Mountains Humanitarian Award, the Idaho Conservation League's Keith and Pat Axline Award, The Fund for Idaho Nel Tobias Award and Idaho Rivers United's Legacy Award. Doug loved skiing, enjoying the ocean and the wilderness, Mexico, helping those without voices, taking long runs on Mount Tamalpais with his buddy Allen Kreuzberger, spending time with his family, listening to music, reading The New Yorker and fighting injustice. Doug would have appreciated gifts to the organizations mentioned above, as well as Save Our Wild Salmon and the Boulder-White Clouds Council. A celebration of Doug's life will take place Friday, Feb. 17, at 6:30 p.m. at the nexStage Theatre in Ketchum. Cremation was under the care of Wood River Chapel. Friends are invited to leave condolences or light a candle at www.woodriverchapel.com.